Today I want to tell you about a fun get-together our family does every October! There’s plenty of time for you to plan one if you like the idea! We’ve had some amazing winners in the past…like Crocodile Hunter and Tiger Woods. Last year though, the stakes were high. There were drills, fancy carving tools and my sister carved…are you ready? The face of the Lord. I remember thinking when the face of Christ lost that we just might be getting overly competitive. Maybe it would help year off! So this year we’re having a Chili Cook-off instead! The competition promises to be just as fierce since we have some major competitors in the group, I’ll let you know how it goes! We take a family photo every year too. These photos are so precious, showing the way our babies have grown and reminding us of how those we love aren’t here forever. The family photo is one of the most important parts of the time we have together. 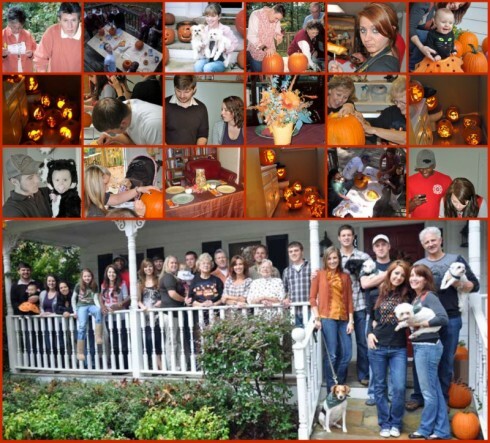 Might be fun to get family and friends together this month for a pumpkin carving or a chili cook-off. It won’t be long before the whirl-wind of Holiday activity starts! Perfect! I love your new ideas. I was blessed to be a part of this event last year and had a blast! Your family is so much fun, thank you for a great party! Seriously?? 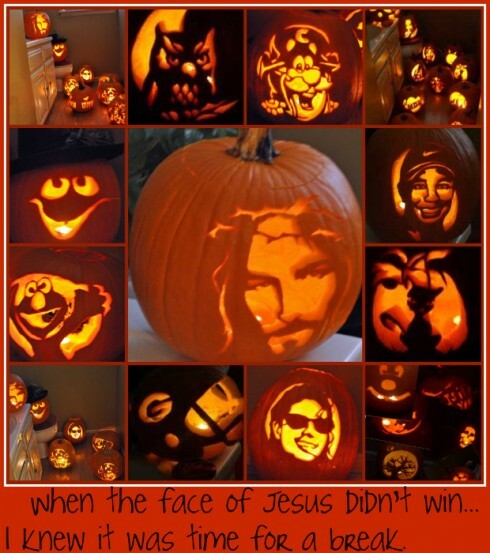 The M & M’s a good….but the face of Jesus, hmmm, was there a recount?? All in good fun I am sure! That, my friend, is a mighty big family. I hope everyone comes with belts that loosen or with pants that have elastic. That chili cook off sounds like a belly full. I cast my vote for you…if you make it with chicken or turkey meat (and then send me some). 🙂 Love and hugs to you today. What a great idea. I would love to do something like this but seems like folks schedules are so full. I know a family who gets together for an apple butter stir off. We’ve gotten together to watch football games but I like the addition of other activities. Making the shoe boxes is a fabulous idea too! Now that we are living in the same town with our grown kids and more extended family, I think the idea of a pumpkin carving party would be Perfect! Lord knows my husband is into carving pumpkins, as are both of my boys, so we might have some pretty stiff competition. So, if the face of Christ didn’t win, who trumped it??? .-= Jane Carter´s last blog ..WARNING – Delay Ahead!!! =-. .-= Entertaining Women´s last blog ..The Bungalow- Part V =-. Oh how I love a family that knows how to throw a fun party 🙂 Can I be adopted? I make a mean chili… will you post the winning recipe for us? You can never have too many chili recipes. .-= Vicky´s last blog ..Extreme Makeover Home Edition- Day 2 =-. .-= Tom Raines´s last blog ..Affirmation of God- My citizenship is in Heaven =-. Would you adopt me, please? I want to be in your family! .-= Jean Fischer´s last blog ..Fear Strikes the Queen! =-. .-= pamela ponder´s last blog ..WORDLESS WEDNESDAY THE MEN IN MY LIFE =-. You are so blessed that you have a large family that enjoys getting together. What a talented group. That’s some pretty fancy pumpkin carving. .-= Sandy´s last blog ..Cottage Style Decorating – Choose Your Own Style =-.